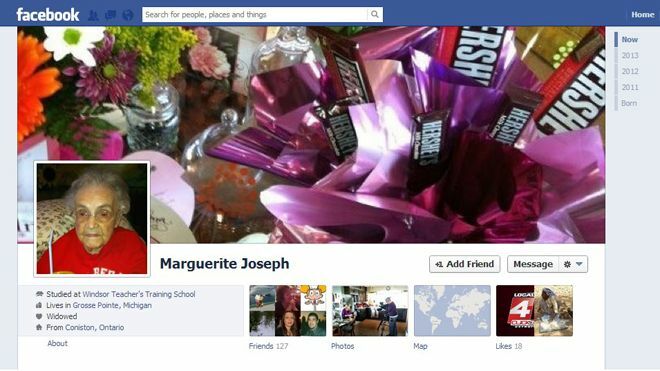 Just one day after Mark Zuckerberg announced huge cash prizes for scientists working on extending human life, Marguerite Joseph was forced to lie about her age after signing up for her very first Facebook account, you see marguerite is 104 and the social media giant failed to recognize people her year of birth as an option. The Michigan centurion’s (plus 4) granddaughter says Joseph is unable to list her real age on the social media site. Gail Marlow says when she tries inputting her grandmother’s birth year as 1908, Facebook changes it to 1928. So for the past two years, the Grosse Pointe Shores centenarian has remained 99 — online, anyway. Joseph is legally blind and can’t hear well, but Marlow reads and responds to all of her Facebook messages. A Facebook official did not immediately respond to a message Wednesday seeking comment. FOXNews.